Findings: Mass in the left parotid gland (a) with peripheral enhancement and central low attenuation with a thick rim. No adenopathy on these slices. 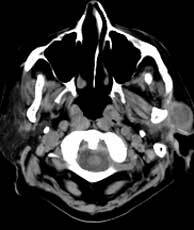 Contralateral parotid is normal. 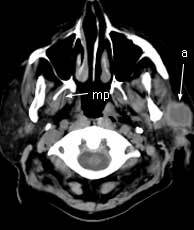 Medial pterygoid (mp). Parapharyngeal space (pps). Torus tubarius (tt). 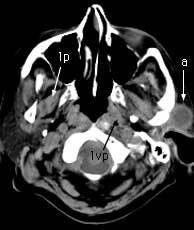 Longus capitis (lc) in the retropharyngeal space. Internal carotid arteries (ica). Lateral pterygoid (lp). Levator veli palatini (lvp).